Simple and useful. Also fits under my cabinets. My husband really just wanted a drawer unit but sadly his machine will not fit once put on to the drawer unit so we were in the market for something that worked better. In steps Kuuk Nespresso Coffee Pod Tower which also hold most of our K cup pods as well, and our problem is solved. A nice way to have the coffee pods ready to go when company is over. My hot cocoa pods even fit so between tea, coffee, and cocoa we have it covered. You can find this Coffee Pod Tower on Amazon. Easily store and access all of your Nespresso capsules with this convenient and attractive carousel holder. For all the Nespresso lovers out there, this is a must-have addition to your kitchen. Have you ever scrambled around in a cupboard somewhere trying to find the Nespresso, only to find... there was none left? With this Nespresso holder you'll never face that problem again because all your Nespresso capsules will be clearly laid out and organized right there on the kitchen counter. You'll know exactly how many you have of each flavor, and you won't have to scramble in the coffee drawer ever again. 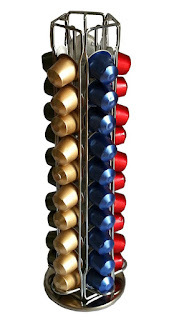 This Nespresso carousel is built to rotate smoothly so you can easily access all the different flavors you love. Keep a different flavor in each of the four rows, or mix them up to your preference, and simply spin the carousel to select your drink of choice. The stylish, modern Nespresso capsule storage unit is made from high quality chrome wire, with a stainless steel finish. It is elegant and lightweight while remaining sturdy at the same time, keeping all your Nespresso capsules held firmly in place. Disclosure: MarksvilleandMe received one or more of the products mentioned above as part of a promotion with Tomoson and Kuuk. Regardless, MarksvilleandMe only recommends products or services we use personally and believe will be good for our readers. Some of the links in the article may be “affiliate links.” This means if you click on the link and purchase the item, I will receive compensation. If you would like MarksvilleandMe to review a product or service please contact us at marksvilleandme@gmail.com.